Terry and Gordon set of magnets inspired by Canadian greats Terry Fox and Gordon Lightfoot, with illustrations by A Cagey Bee. 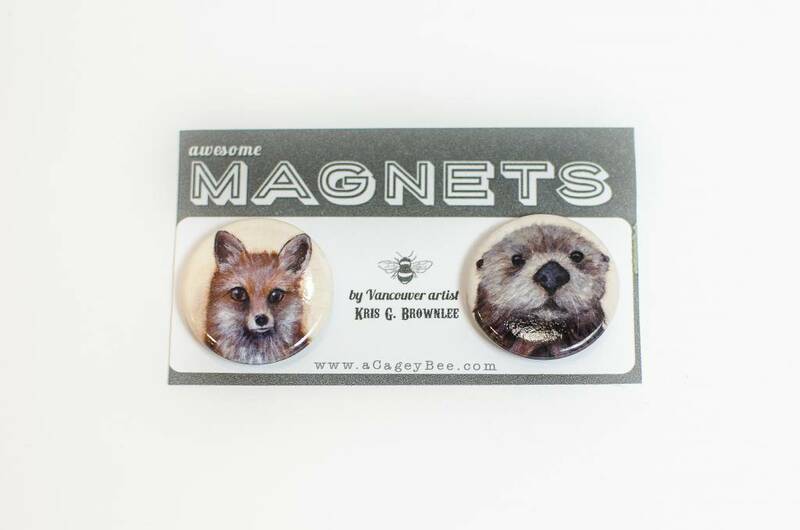 Terry and Gordon are a set of two 1.5" magnets inspired by Canadian greats Terry Fox and Gordon Lightfoot, illustrated by A Cagey Bee. Vancouver based artist, Kris G. Brownlee (A Cagey Bee), began to paint her animal portrait series, the Great Canadians, with tourist and collectors in mind. From singers, songwriters, artists to activists, these faces remind Kris of her roots and the beautiful place she calls home. Designed in Vancouver BC, Canada.